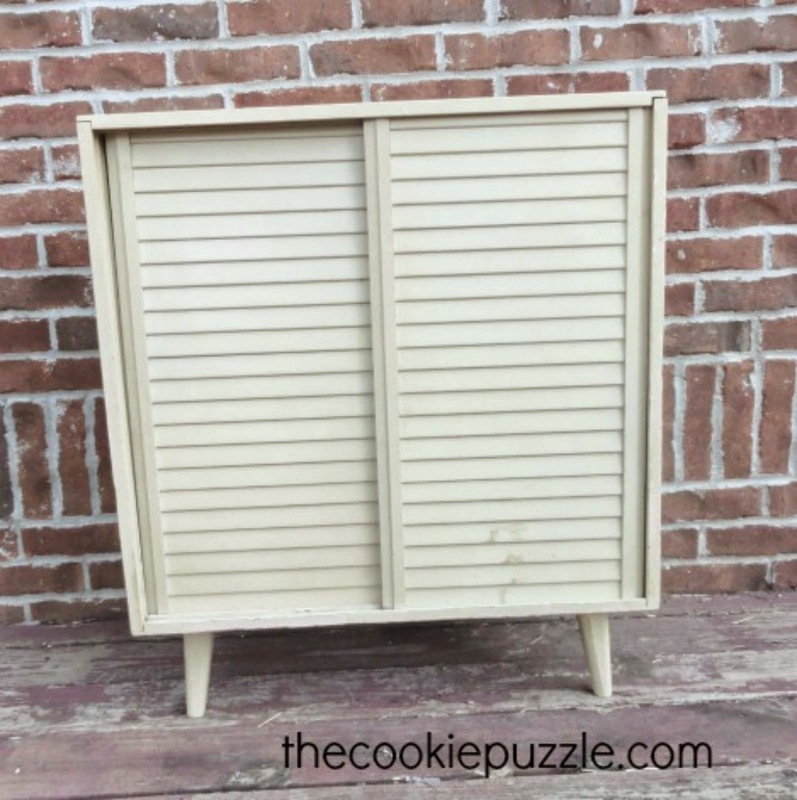 Making over an old piece of furniture is easy when you use chalk paint. I have become almost addicted to the stuff. 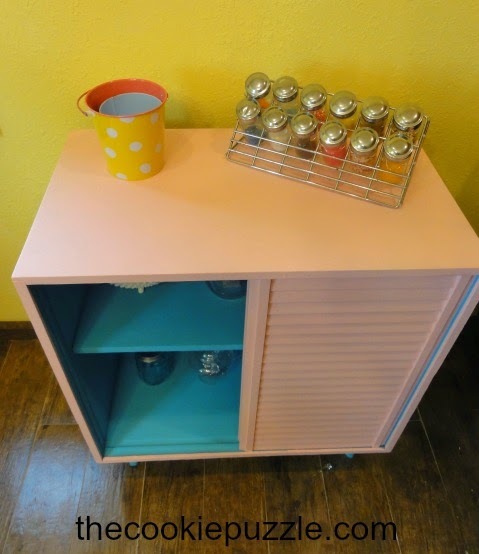 I have used a couple of store bought chalk paint and DIY chalk paint. Both of them work beautifully and I find myself "searching" for stuff to paint. bought new furniture for my mom's room. 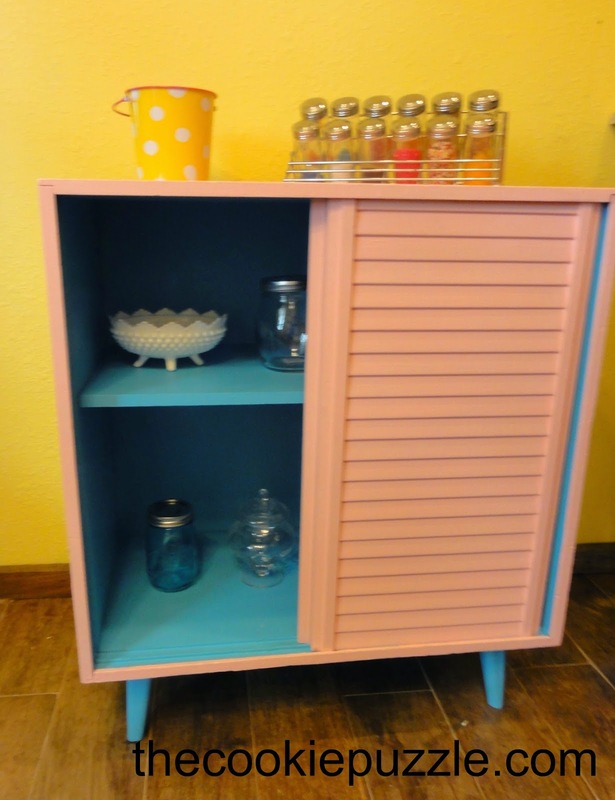 She picked out three pieces, a corner cabinet, a chest of drawers and this little cabinet. I am at a total loss as what to call this piece. It was purchased in 1962 and made out of pine. It came unfinished and my great grandmother painted it pink for my mom. When my mom took it with her, she painted it a beige color..and it stayed that way until I got my hands on it. I knew I wanted ti to be pink again, so I painted it with Americana Decor Chalky finish paint in the color of Innocence, which is a light. yet fun color. I removed the doors to easy painting and painted the outside of the cabinet. 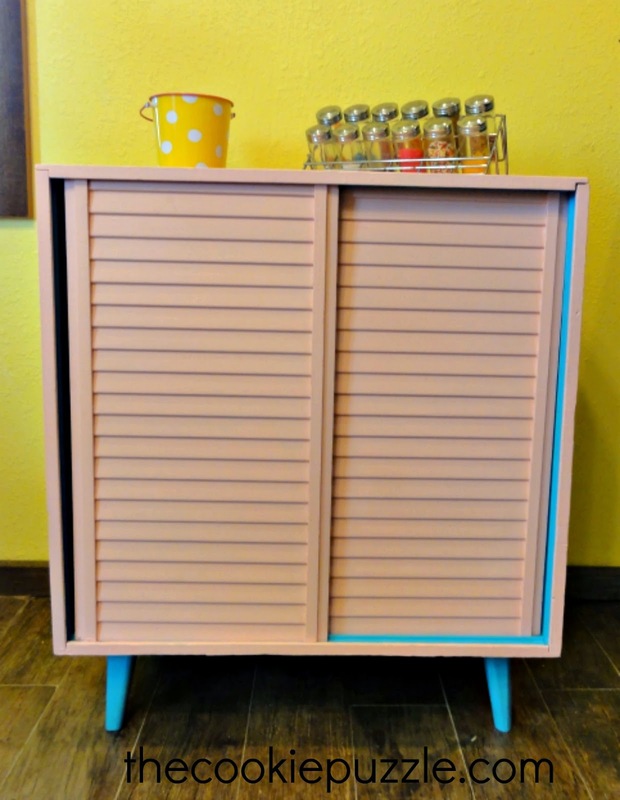 I was totally planing to paint the inside the same color...but then...I totally changed my mind, and painted the inside and legs with the same color of Pool Blue DIY chalk paint I used for my Sewing Table Makeover. I finished it off with two coats of Soft Touch Varnish, also from Americana Decor. I am totally in love with this stuff...it goes on easy, is durable and does not have to be re-applied and is good for both interior and exterior use, and the best part, at least for me, it that is does not have to be buffed. I am so happy with how the finish product turned out, and thankfully, my mom loves it too! I really thought about leaving the doors off, but end the end, I knew I would use this cabinet to store my craft products, which are not all cute and fun looking, so I decided to keep the doors, to allow me to "hide" my not so pretty craft stuff. I have gotten many questions about how this soft touch varnish compares to traditional paste wax that is often used with chalk paint. Well, I don't know. I have never used paste wax, so I can not answer that question. Since my chalk paint addition has started, I have painted 8 chairs, 3 bar stools, a small wall cabinet, a sewing table this cabinet and several other items, each and every time I have used chalk paint, my finish of choice has been this soft touch varnish. I would love to be able to answer your questions, but I simply can not. If you have questions about this product, ask away. If you have questions about Americana Decor Chalky Finish paint, ask away. If you have questions about Folk Art Chalk Paint, ask away. Want to know more about the DIY chalk paint I use, I am an open book. If you are wanting to know about paste wax versus the soft touch varnish...sorry...I have no answers for you. 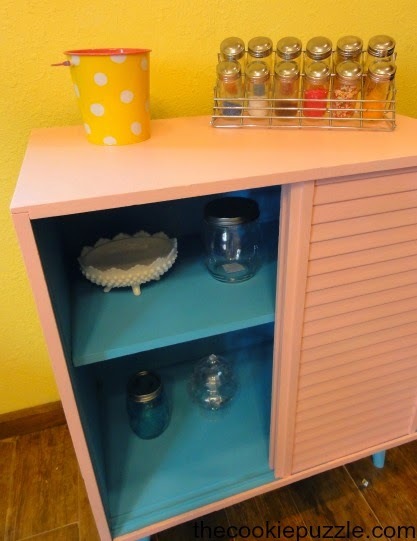 This cabinet is now full of craft supplies...doing a wonderful job at brightening up my cookie/craft room!